Carmen and I went to a local favorite, Las Ranas (“the frogs”) Cafe Restaurant, not far from our home at the Village Green. 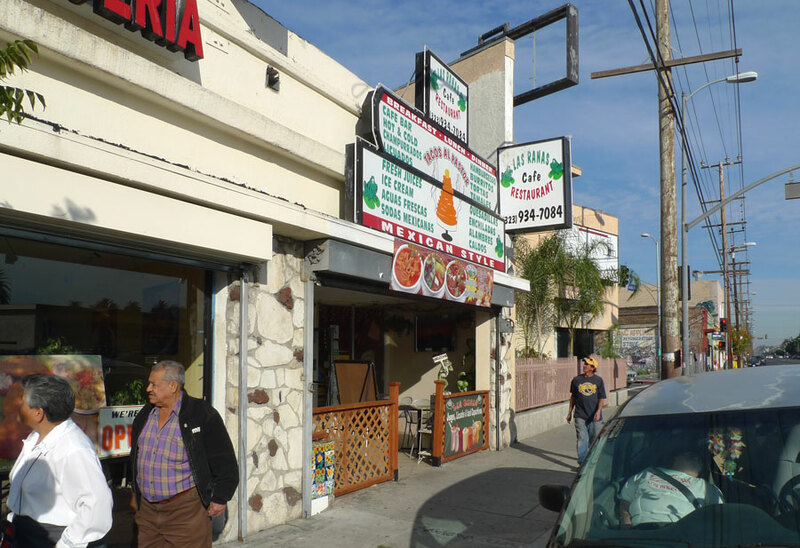 I was initially attracted to their storefront sign, proudly proclaiming “TACOS AL PASTOR” above an illustration of a revolving meat spit thing, which bears a resemblance to a giant steaming turd. The dining room is nice, except that they have a couple of big televisions, which are turned up unfortunately too loud. 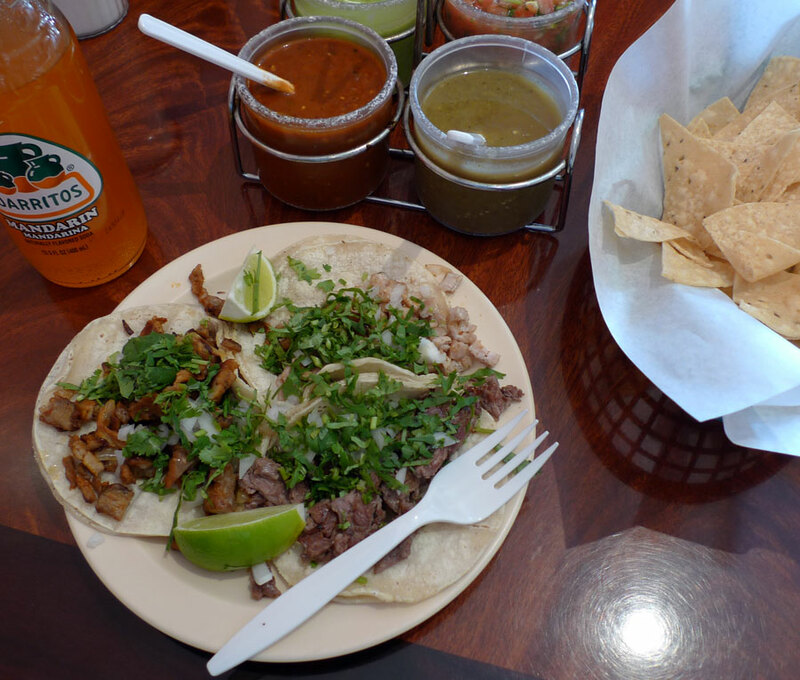 I had three tacos, one each of carne asada, al pastor, and chuleta (pork chop), as well as a Jarritos Mandarina. The tacos here are solid, if not extraordinary. They are average in size and cost $1.25 each. The tortillas here aren’t so good as the last couple places I’ve been – they are soft on the bottom, but not so soft that they delaminate and stick to your fingers, which I hate. They are average. The tacos have a lot of cilantro on them. While you wait, they bring you a basket of chips and a caddy with four types of salsa. The spicy rojo is good and tastes like what it looks like. The thicker green sauce is strong and pungent with lots of cilantro, reminiscent of the Peruvian “aji verde” sauce. The pork chop taco is unusual. The meat is chopped into quite small and thin bits, probably from a pork chop that was pounded with a mallet into thinness before cooking. It has the strong salty, seasoned flavor you find in Latin American pork chops. The green salsa, also very salty, seemed to go with this taco, and made a pleasing and salty combination. The steak was fine, but unremarkable. The al pastor is very tasty, though. Also cut into quite small bits, it’s savory and consistent, but not terribly distinctive. In summary, Las Ranas is an average taco shop, so of course, I love going there. Whats going on with the guy in the passenger seat of that car? Ah yes. There is a woman in the passenger seat of the car. We suspected she was either asleep or dead. Carmen and I went back to Las Ranas Sunday evening, 1/31/10. I had more tacos. They were excellent – bigger and tastier than during our visit on the 10th, with superior tortillas.